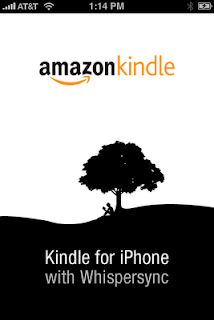 Making a Kindle app for the iPhone [iTunes link] must feel like a double-edged sword for Amazon.com. The iPhone app will sell a lot more Kindle books but there is no guarantee that it will translate into selling more Kindles. By the way, if you don't know what a Kindle is it's the electronic version of reading books. Although the Kindle 2 is much thinner and lighter than the original Kindle, it will set you back $359. You'll have to be an AVID reader to get your money's worth. As far as the iPhone app goes, I don't have any Kindle books nor do I really have the urge to buy one. But, I wish you could at least browse through the available Kindle books and buy one through the app like the Amazon.com Mobile App. Let's see if this app will light the fire on electronic books or if these Kindle books will simply burn out.